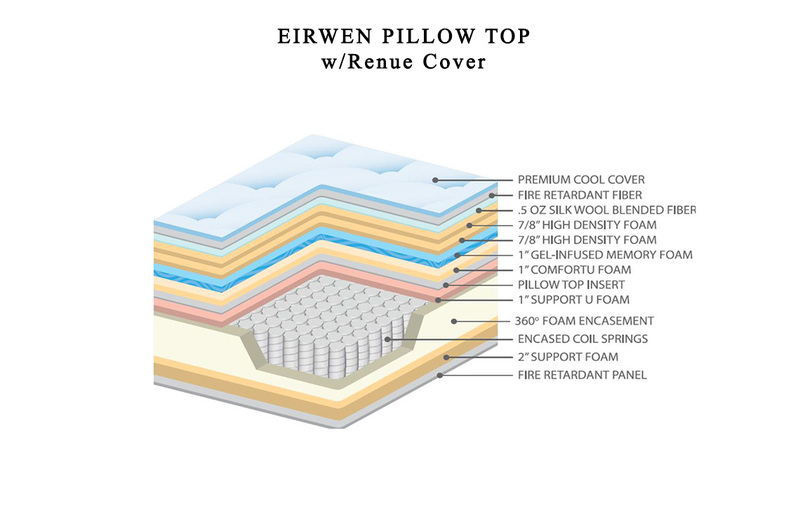 The "Eirwen Pillow Top" by Corsicana is part of this long-standing manufacturer's revolutionary line that features the "Renue Cool" cover; an expertly crafted blending of materials that continuously adjusts to your body temperature and dissipates excess body heat. Keeping that same emphasis on not sleeping hot while benefiting from the therapeutic effects of visco-elastic memory foam, Corsicana has added a gel-infused memory foam layer. 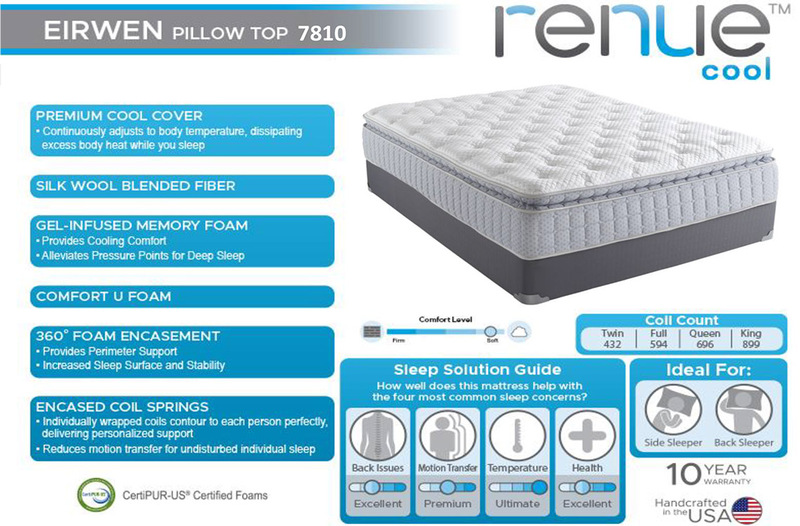 Beneath this cooling and pressure-relieving layer and both "ComfortU" foam and "SupportU" foam, this model features a lower gauge (thicker, stronger metal) individually-wrapped innersping coil system. Foam encasement decreases motion transfer and - of course - increases the sleeping surface and stability of the mattress. 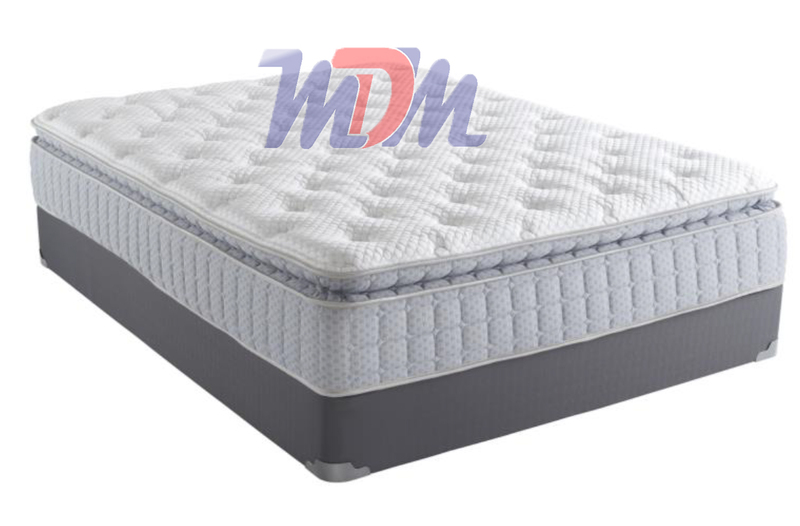 There are also layers of high density foam (as well as a bottom support layer) that contribute to this not only to this being an unbelievably comfortable mattress but also, a long-lasting one. This mattress is made with those who love a soft feel in mind. However, it will also lend the much-needed support that many other softer/plush mattresses lack. Both side sleepers and back sleepers will enjoy the benefits of this premium mattress. Made from CertiPUR-US materials in the United States. True luxury at an affordable price! Always with an emphasis on 'quality for less', Corsicana seems to have really outdone themselves with the models its made in this "Renue" series. (which refers to its cooler-sleeping cover's materials). There really is nothing one could add to this mattress - regardless of price - to add to its comfort, stability, support or overall value. Very nice mattress for anyone looking for a softer sleeping surface. With a build-up of many specific layers, it's apparent that not only was the manufacturer looking to provide a great feel with this mattress; they were creating something that would last and keep its feel for a long time. They've gone the extra mile to alleviate the heat retention that can come with a mattress that contains memory foam and not only provided a cooler cover but also a gel-infused layer. 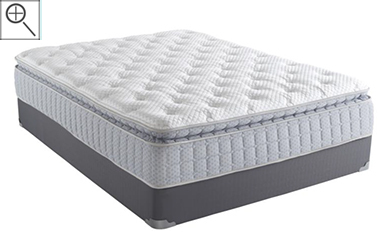 The pocket coil in this unit is a relatively low count which means that it's a thicker gauge of metal and that makes me 'rest easier' as well - when offering a softer, plush mattress. The "Eirwen Pillow Top" is sure to become one of our more popular mattresses models - especially for those who like the soft feel. Soon, we will be offering a firm version of this build-up and I personally can't wait to try it out!